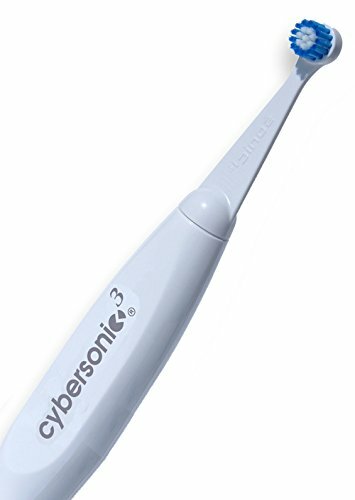 The best electric toothbrush in my opinion is the Cybersonic 3 toothbrush. (Read my review of the Best Sonic Toothbrush here). As well as being an excellent toothbrush, there's another great thing about the Cybersonic3; you can get a HUGE DISCOUNT if you use my special discount code on the Amden website - CLICK on the image below to read about how this works! So, AFTER the Cybersonic 3, what's my next "Best Electric Toothbrush"? In this Electric Toothbrush Review, we look at 3 price points; the Cybersonic 3 is available for about $50 (with my discount code). TWO other electric toothbrushes that I really like are priced at around the $100 level and the $200. (Both from Amazon). And the Oral B Pro 7000 (a Braun electric toothbrush). But first, let's take a closer look at the Cybersonic. What makes it MY CHOICE for the best electric toothbrush? The Cybersonic 3 is a true sonic care toothbrush. This means that the bristle tips vibrate at a rate far above normal electric toothbrushes. In fact, it achieves over 40,000 vibrations per minute. It's important because the higher the frequency of the vibration, the smaller the tiny bubbles created by the bristle tips and so the better the cleaning effect. The super cleaning effect is multiplied by a clever trick. Amden designed the entire brush head to have a resonant frequency of 40,000 vibrations per minute, the same rate as the bristles. This clever use of "resonance" reinforces the bristle tip power and effectiveness. Size and weight of the Cybersonic are surprisingly small. I find that some electric brushes have quite bulky handles, and can be a little heavy, especially if you have small hands. The Cybersonic has a relatively slim profile, and I like the way it sits comfortably in your hand. It has a smooth, simple handle design that stays clean. Battery performance is very good. With a full charge, it will last for a full seven days of normal use. That's impressive! It means that if you have a trip away from home that is less than seven days, you don't have to take the charger with you. Just make sure that the brush is fully charged overnight before you leave home. The Guarantee. To win MY title "the best electric toothbrush", any brush will need a decent guarantee. The Cybersonic 3 comes with a standard one-year guarantee against any defects in it's construction. You can also get a Lifetime Guarantee simply by agreeing to have new brush heads sent to you at regular intervals. If something goes wrong with your brush, you can get it repaired or replaced under the Lifetime Guarantee. This program was originally limited to the USA and Canada, and used to have the unfortunate effect of limiting sales of the Cybersonic to those countries. However, the brush is now more widely available. Price. Last but by no means least comes the cost of this brush. Considering the technology and performance of this sonic tooth brush, you might expect a price well over $100. BUT you can get it for HALF of that. You can get the BEST PRICE by using my UNIQUE COUPON CODE NUMBER on the Amden Corporation website! You have to go to Sonictoothbrush.com, and when you order your Cybersonic 3 system, you MUST use the coupon code number 11486826. You will get the brush system at 50% of the standard recommended retail price, which is even BETTER than you can get at Amazon - or anywhere else on the planet. I think that's definitely extremely good value for a candidate for "best electric toothbrush". The extra attachments. As well as the standard brush heads, you also get a tongue brush and a flossing attachment. They both just click right into the Cybersonic handle and away you go! The tongue cleaner is is easily the most effective one I have used. It almost makes the Cybersonic worth getting just for the tongue cleaner! As far as I can see, there is just 2 aspects that I am not keen on. This is the 30 second timer. Like all electric brushes, I feel that 30 seconds is a bit on the short side. Also, the DeLuxe brush head looks a bit too big to me. I would recommend sticking with the standard sized brush head. You can visit my detailed Cybersonic toothbrush page at Best Sonic Toothbrush for a full review. Best Electric Toothbrush - alternatives? There are 2 possible alternatives for the title "best electric toothbrush" - but they are both more expensive than the Cybersonic 3. First up is a Philips Sonicare toothbrush. I think the best model is the Phillips Sonicare DiamondClean Smart. The second alternative is the Oral-B Pro 7000 Electronic Power Toothbrush. This is a Braun electric toothbrush. Now let's look more closely at these two contenders for the title "world's best electric toothbrush". First, the Philips Sonicare DiamondClean toothbrush. There are several other models in the Sonicare range, which you can read more about at Sonicare toothbrush. But my new favorite is the Sonicare DiamondClean. This is a sonic toothbrush that vibrates at 31,000 times per minute at the bristle tips. Like the Cybersonic, this causes tiny bubbles to expand and contract in fractions of a second within the liquid at the bristle tips. This "cavitation" disrupts the dental plaque attachment to the tooth, removing the plaque. This means that plaque can be disrupted up to 3 millimeters away from the end of the bristle tips! The Sonicare DiamondClean comes with 2 brush heads, and a travel case. The battery performance is very good, lasting even longer than the Cybersonic. Philips claim up to 3 weeks of toothbrushing from one full charge! I think that's probably the best electric toothbrush battery performance that I know of. During normal use, this doesn't really matter as Philips recommend just leaving the brush in the charger anytime you're not using it. There's more detailed information at my dedicated Sonicare DiamondClean page HERE. But the DiamondClean has a couple of extra tricks up it's sleeve that make it my new favorite brush. It has a unique way of charging. Basically, you get a chunky heavy glass with the DiamondClean that looks like you could use it to rinse out with. You can. BUT it's also the charging station! Philips have made use of a technology called "Induction" that means that the glass can re-charge the toothbrush battery just by leaving the brush handle in there. There's no socket to plug the brush into. The glass itself sits on a small mat which in turn is plugged into a wall socket. So you still need a power socket somewhere! But otherwise it looks a bit like black magic. Just brush your teeth, rinse out using the glass, then put the glass back on it's mat and dump the toothbrush into the glass! There's also an alternative charging method which is really useful for when you're traveling. The DiamondClean comes with a small travel case. When the brush handle is stored in the travel case, you can plug the case into any USB outlet (like your notebook computer) to charge it up. What a great idea! To me, that's intelligent thinking. What else? The DiamondClean has a new design of brush head. It has 44% more bristles than the ProResults head, and the tips have a diamond cut which gives the brush its name. The bristles are also designed to fade in color as they are used, as a reminder to replace the head after three months. The Philips Sonicare DiamondClean has 5 brushing programs, so you can pick the one you like best. Interestingly, this brush is also extremely quiet. It's the quietest electric toothbrush I have ever heard. (or not heard!). As usual for Philips, it comes with a standard 2 year warranty. Sounds great! Why isn't it "the world's best electric toothbrush"? The only thing against it really is the price. It's more than double the price of the Cybersonic 3, and although it is a fantastic brush, you will have to be the judge of whether it is that much better than the Cybersonic. What about the Oral B Pro 7000? It's the follow-up to the Oral B Precision Black. This Oral B toothbrush is a rival to the Sonicare and Cybersonic for the best electric toothbrush because it is quite different. As the name suggests, it is NOT a sonic tooth brush, but uses Oral B's rotating/oscillating movement for the brush head. It has a relatively slender handle, smaller than almost all other electric brushes. This is good if you have small hands! But those of you with bigger hands may find this brush a little awkward to grip. Despite the small handle and slim profile, it has a battery life of 10 days of normal use. This is excellent if you are traveling, as it means you don't need to take the charger with you for trips under 10 days. However the Pro 7000 is quite loud - it buzzes like a bee! It is quite a bit louder than the Cybersonic, and A LOT louder than the DiamondClean. There are several brushing modes, and it accepts a bewildering array of Oral B brush heads. If you like to have a choice, the Pro 7000 has a great offering. The big question point for this brush is the price. You can get it for around $150 on Amazon, which makes it almost as expensive as the DiamondClean. For that price, it comes with several brush heads and a charging unit. So, as a relatively new Oral B toothbrush, The Pro 7000 is a heavyweight in many ways, and it cleans extremely well and seems to be very robust. If you don't mind the louder buzzing, this could be the "best electric toothbrush" for you, despite the high price! Overall, these 2 sonic tooth brushes and 1 oscillating brush can all lay a claim to the title "best electric toothbrush". BUT I think the Cybersonic 3 system from Amden is the best, because it has a lot of positive features at a very competitive price, ESPECIALLY when you use my SPECIAL DISCOUNT CODE.